A study found that between 1999 and 2014, 15% of children enrolled in Tennessee Medicaid and without severe conditions received an opioid prescription each year. 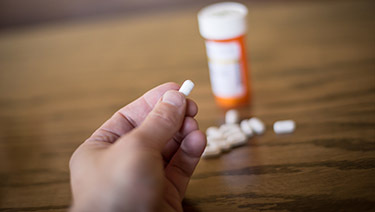 One in every 2,611 of these opioid prescriptions was related to adverse effects which resulted in an emergency department visit, hospital admission, or death. The study, "Outpatient Opioid Prescriptions for Children without Severe Conditions and Opioid-Related Adverse Events," will be published in the August 2018 issue of Pediatrics. The study analyzed outpatient prescriptions for children ages 2 to 17 enrolled in Tennessee's Medicaid program between Jan. 1, 1999 and Dec. 31, 2014 without severe conditions or substance use disorders. Opioids were most commonly prescribed for dental procedures (31.1 percent); outpatient surgical or medical procedures (25.1 percent); trauma (18.1 percent); and minor infections (16.5 percent). Researchers identified 1,179 potential opioid-related emergency department visits, hospitalizations or deaths, and they confirmed 437 by review of medical records. More than two thirds of the adverse events were related to therapeutic use of the prescription. The rate of outpatient opioid prescriptions for children declined over the study period to 10.2% in 2014, but the authors suggest that efforts to improve opioid safety be strengthened.